I’m aware that I do not know Live as deeply as I possibly should, once I find a way to do what I need -no matter how convoluted- I tend just to use that rather than look for alternatives. So, if there are things in my wishlist that I Live can do already, please comment and let me know! Mono tracks. I don’t need all my tracks to be stereo. I’d like to select whether a particular channel is mono or stereo so that I’m not using twice as much processing power when I’m running effects on that channel. Groups within groups. Yes, there are ways to route things, but I’d like to be able to nest a few things. For example, I often use two or three different tracks for the bassline. I’d like to be able to group those, then have that group in another group with the kick drum so I can compress the low end together. An easier way to turn clips into songs. I always start out in session view, separate channels for different sounds and instruments, then a few variations within each channel. Once I’m there, I’d love to have an easier way of getting those variations into the arrangement view would be nice. A ‘paintbrush’-style tool in the arrangement view that allows me ‘paint’ sounds down on the timeline from the ‘palette’ of sounds that are available in the session view of that channel would be absolutely fantastic. ‘Pinging’ an external effect to set up device latency. How fantastic would it be if the external effect device just had a button that said ‘ping’ or similar, which would then send a test tone to the external effect and learn how long it takes for the audio to make the round trip, ideally to within a tenth of a millisecond or better. Perfect. There are a few more little niggles, but that should cover it for now. As for what is in Live 9, I bought the full version of Cytomic’s The Glue quite a while ago (excellent plugin, can’t recommend it highly enough! ), so the new Glue compressor is just typical of my musical investments, but reassuring that I backed a winning horse I suppose! The audio to MIDI feature is what I think will make the biggest difference to my workflow though: looking forward to recording those solos and ear candy ornamentations with the guitar, changing them to MIDI and playing about with synths, electric pianos and anything else I’m not very good at playing! Bring on the release of Live 9! The online music revolution has, undoubtedly, been a revelation for today’s producers wanting to be heard. Gone are the days of optimistically sending demo tapes, or spending a small fortune on getting a first run of vinyl pressed to try to build a following. Now, sites like Soundcloud make it easy to make your music available, and aggregators such as Tunecore and Rebeat allow you to go down the do it yourself route and get your music into digital stores. Unfortunately, opening the industry up in this way has in some ways just moved the goalposts. Now, instead of the bottleneck for new entrants being recording and production, it’s the marketing; it’s far easier to get your music to the people, but with millions of others doing the same, it’s quite another to get them to listen. It seems we’ve gone full circle: far from being liberated from the label system, artists now need to get signed, not only to benefit from the label’s promotional budget, but, as anyone can get a track on iTunes these days, to use the brand to add an air of ‘legitimacy’ to their product. Fortunately, hand in hand with the revolution of digital music distribution has come the age of social media, which offers the chance to pull your audience to your creations, rather than simply relying on pushing content out into the world and hoping for the best. So, how can you use social media to build a following and start to get word of mouth working for you so that, when your release drops, there are people waiting to hear it? 1. Use SoundCloud and get a pro account. Soundcloud is perhaps the most popular forum for producers, djs and labels, combining cloud storage, streaming and download services, as well as the chance to interact and comment with other users. A pro account costs from 29 Euros a year and shows that you take what you do seriously, as well as giving you more music time and better analytics on your listeners and downloaders. 2. Use social media as a home for your news, and keep your name visible, but don’t sign up for every social media outlet that’s out there; keep it manageable so that you can keep each one regularly updated with good content. The big three are Twitter, Facebook and a blog: Twitter for regular ‘drip feed’ exposure, and Facebook or a blog for more developed, less transient, content. Also think about linking accounts where possible so that new Soundcloud uploads and favouritings and blog posts etc are announced through Twitter and updated on your other profiles. Just be careful that you don’t end up either spamming by accident, and don’t use this as an excuse to be lazy – it’s not enough to use links to save you putting the work into each one separately. 3. Keep it relevant. Don’t start following 5000 people who aren’t likely to be interested in you just to try and get a crowd of followers; keep things related to what you do, even if it’s just tangential, such as people in the same city etc. Investigate using Twitter lists to manage those you’re following, and check out the lists of people you follow to find new contacts. 4. Support your fellow emerging artists. Don’t ignore your peers and only follow big name artists: they represent a large demographic and if you respect them, they’ll respect you. Plus, rising stars who like what you do are more likely to share it. But do look for people with lots of relevant connections, what network analysis would call ‘hubs’ – if they share something you’ve done, it reaches a much larger group of people. But social media etiquette suggests that genuine relationship building and reciprocal sharing is better than begging for retweets. 5. Soundcloud groups provide a good way of identifying people with similar tastes and are often visited by major signed artists and labels. Join groups, follow people whose work you like, and contribute. 6. Be visible on Soundcloud, release free-to-download tracks occasionally (and not just the stuff you don’t think is good enough to send to labels) and add them to the relevant groups. Make sure and comment regularly on other tracks, and try to avoid asking people to listen to your latest in the comment! 8. Interaction is the key to social media. In order to be successful you have to give as well as take. Look for any opportunity to get your name seen, but without crossing the line into spamming or trolling. Join forums, post, comment, follow music blogs, post reviews of products on music store sites, enter remix competitions and generally keep your eye out for opportunities to increase your visibility. Investing the time in interacting with people also positions you as someone with a genuine interest and certain level of knowledge/expertise, and that’s important if you want to be taken seriously. It seems as though, after spending hours playing with arrangements, and adjusting level, eq and compression settings, when you finally have that final render down and master, that the hard work should be done. These days though, it might only be just beginning; but, if you put the time in early, it might pay off in the long run. Just remember that you can only harvest what you sow. DT-880 Pros are pretty well reviewed already –they’ve been around for a while, after all- so why should you read this one? Well, first of all it’s another opinion and, secondly, as far as I can find, no-one has talked about their suitability for house music production on the road using an Apogee One as an interface. I’ll assume that you’ve read some other reviews and product descriptions, so I’ll not repeat all of the basics and just concentrate on my experience with these headphones. Let’s start with comfort. Despite being a bit heavier than its main competitors, the Sennheiser HD650s and the AKG K701s, these are comfortable ‘phones. There isn’t too much downward pressure on the top of your head; the inward pressure feels reassuring, with a feeling of closeness without causing any discomfort, even after long listening sessions. The material used for the padding is smooth and soft, and doesn’t make your head too sweaty, which is always a bonus. Appearance is pretty good too. The ‘phones come in a nice foam-lined zip up case and look the part. If I have any complaints, it’s that the cradles that support the cups look like a bit of a design afterthought, and the exposed cabling looks thin and fragile, but then, these headphones are cheaper than both the AKGs and the Sennheisers. Build quality and potential long-term functionality is where I start to have issues. First off, the cable is non-detachable, being moulded into the bottom of one of the cups, so any wiring issues are going to be complicated to resolve, with higher repair bills, as described in this review. If I’m being honest, I don’t think any phones at this price point should have moulded cables, particularly those with ‘Pro’ in the name. I’m also not sure about running that thin little cable from one cup to the other by tucking it under the detachable headband. Those cables seem very delicate, and I’m genuinely quite concerned about them snagging on something at somepoint, having them pulling out of the cups, and expensive repair bills resulting. Not sure that this feeling of breakability inspires confidence in a pair of working headphones. Compared with my Sennheiser HD555s, which were a third of the price, this cup to cup cabling arrangement seems poor. The size adjustment is also a bit clunky, with the cup, brackets sliding back and forth in not a particularly smooth way. This is something I expect to be doing a lot of, as, with the ‘phones fitted to my head, putting them back in the case means that the moulded cable is at quite an extreme angle, and under a lot of stress, due to the snug fit in the case, so, to minimise that, I have to push the brackets back in again. Then, every time I resize, I’m concerned I’m going to catch the cables with my fingers. The sound performance is where the DT 880 Pros redeem themselves. These are the best ‘phones, from an accuracy perspective, that I’ve heard. The HD650s are perhaps more exciting to listen to, with the more ‘hyped’ bass response, but for critical mix decisions, I’d feel more comfortable trusting these; everything just seems more flat, and ‘egalitarian’ in the mix. Bass is low and extended, but feels well controlled. These are exceptionally good sounding headphones for the money. Listening through an Apogee One after allowing a good length of burn in time, playing a variety of tracks showed this to be a good, reliable performer, from Alison Krauss to Maya Jane Coles, via KT Tunstall, Teenage Fanclub, Jacqueline du Pre and The Pretenders. I enjoyed the level of detail, accurate soundstage and the depth of the mix that was presented. Great performers. So, the real reason for using these ‘phones, those late night deep house production sessions when using monitors is out of the question. After firing up Ableton Live 8, plugin 112 dB’s excellent Redline Monitor plugin into the master effects, I got to work. I can’t remember the last time I found it this easy to dial in a good kick sound. I usually layer two or three, and filter and eq to get them working together, then compress. I had a sound I was happy with in next to no time. Balancing and eqing my layered clap and snare hits was a breeze, and before I knew where I was, I had the bass sitting comfortably in a hole and, to me at least, a reasonably complete groove going on. As I’ve discussed in a previous post, I would rather mix on good headphones than cheap monitors in an untreated room; these ‘phones have raised the bar as to what good monitors in a good room are. I can see myself spending a lot more time mixing on these, the level of detail available to make those critical decisions and hear those little distortions is fantastic. Combined with the Redline plugin, I really do have the confidence to make mix decisions on these. Well, the sound is spectacular, I feel happy mixing on these, and would much rather mix on these than speakers that are getting to a less than modest price point. The issue for me really is that feeling of delicacy, and, if there is a problem, a large repair bill. Despite the protective case, I can’t picture myself travelling with these ‘phones, which is a shame as it would be fantastic not to have to waste hours remixing everything when I get back to the studio. Unfortunately, I think I’ll stick to my K271 mkIIs for the road, even with their lack of bass response, purely as they feel more robust and have a detachable cable. Oh, and their closed back so I’ll annoy fewer people in coffee shops! I read a lot of reviews of audio tech products, synths, preamps, compressors, EQs, software and hardware and the reviews I read are generally incredibly thorough. Boutique outboard is dismantled to check build quality, given the Windt Hummer test to check for potential ground loop problems and distortion and bandwidth figures quoted; and that’s all in addition to how it sounds. There is little to complain about in terms of detail. However, is that review sufficient to make a purchasing decision? A lot of these reviews seem to lack one critical component: a blinded scientific comparison between the product under review and its competitors. I know this would add complexity to a review: it would take at least two people for a start, and other pieces of gear may not be available for comparison, but I think this type of test would really allow people to make better informed purchases. For example, when I read a review that describes a new digital converter as, let’s say, producing ‘an open, clear sound with good separation of individual instruments and excellent stereo imaging’, I would have more confidence in that statement if the reviewer was able to tell this unit apart from its competitors, or perhaps cheaper competitors, in a blinded test. I remember reading an article in which a number of top engineers took part in a ‘shootout’ between D/A converters, there was no clear consensus on one unit in particular sounding ‘better’. Unfortunately, these were all high-end units; it would have been very interesting if some prosumer and consumer-level converters were also included. Would the golden ears be able to choose between Apogee and M-Audio, or Prism and MOTU? I wonder, though, if perhaps the industry might be scared of the results. Following the success of Native Instruments’ Maschine comes the Maschine Mikro, a stripped down piece of hardware for those with either more limited wallets, or those needing a bit more in the way of portability, but with exactly the same power of the Maschine software. 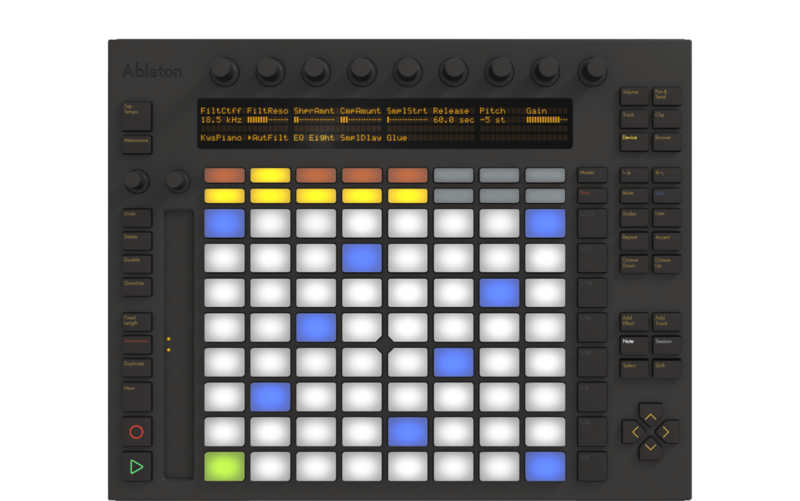 If you’ve not checked out the Maschine before it is, fundamentally, a groovebox: everything you need to make a complete tune (once you add a computer…), albeit with the advantage of a full-size screen, rather than squinting and menu scrolling on the grooveboxes you may have used before. Having myself previously struggled with a Yamaha RMX-1 and a Roland MC-303, I’m quite glad in the change of working method! However, as Maschine has no real synth engine of its own, it perhaps has more in common with Akai’s MPC range of sampling boxes, although Maschine does have the useful ability to host VST instruments and effects. The take-home point is that the Maschine hardware is just a controller: it needs to be connected to your computer running the Maschine software to do anything. My main reason for buying a Maschine Mikro was that I was in the market for a new pad controller and percussion library anyway, so Maschine seemed like the perfect choice, with the alternative workflow of the Maschine software an added bonus. The pads have a great feel to them and have encouraged me to develop my finger drumming skills, and the smaller footprint fits in my studio setup more easily than the original Maschine. The included sounds are very comprehensive: they range from world percussion, through 60’s acoustic kits and on to contemporary electronic kits. In addition to the drum and percussion sounds, there are also a number of synth and musical samples, ready to be mapped to the pads. I’d almost forgotten how inspirational it was to just play some sounds in live, and add all those deep house conga fills in in real time. There are loops and grooves that I just don’t think I’d have come up with I’d been programming with the mouse. Also, as mentioned before, Maschine can host VST plugins. I’m imagining that I will be taking advantage of this in the near future, as I get to grips with Logic Pro, and may well end up using Maschine as a VST ‘wrapper’. For me though, the most useful feature is one that allows Maschine to fit in with my workflow in Ableton Live. Before arranging, I work predominantly in the clip view. Maschine allows you to drag loops you’ve created in the Maschine sequencer plugin into an empty clip in Live as either audio or MIDI. This allows me to create a whole bunch of loops in Maschine, then work with them as audio in Live. That way, if you don’t want to mess around with learning the Maschine sequencer and its scenes and so on, you can use it solely as a loop creation tool and continue to work in your sequencer of choice. So far, I’ve had a couple of bugs with this, which hopefully NI will address in future updates, but it’s nothing that can’t be fixed by moving a couple of warp markers. To summarise then, the Maschine software is fairly intuitive and deeply powerful, with a superb range of included sounds, which can be supplemented with additional -pay for- packs. The Maschine Mikro loses some of the real-time control that you get with the original, due to the cut down encoder complement, and you’ll spend more time looking at your computer as the Mikro loses a display. For the money though, I think it’s a pretty inspiring piece of kit. I’ve had mine for three months and feel like I’ve only scratched the surface. This article first appeared on NowThenRecords‘ website. EDM: The Most Democratic of Arts? If it was Slash who made me first pick up a guitar, it was Noel Gallagher who made me want to join a band. In a recent interview, Noel was heard to say “any f*cker can make dance music”. This quote led to some major activity on Twitter, with the consensus being that he was probably right, but that there is a difference to making dance music, and making good dance music, which is probably fair. Tim Exile put it well when he tweeted that “making dance music is the new gaming”. I have to say, I think it’s great; it means that electronic music is one step closer to becoming the purest, most egalitarian and democratic art form. You can now have more studio power with a cheap PC and a Computer Music cover disc than The Beatles had. Even if you go back to perhaps one of the last big shifts in accessible recording, the Tascam Portastudio, you were still looking at a sizeable investment, particularly once you added microphones and effects units etc. Now, even with freeware VSTs, you can make some professional quality tracks. I spent significantly more money than I had on my Virus TI, but my freeware Juno and SH-101 still see frequent use. Everyone has always had the ability to make music, even if that was just banging out a beat on a rock and a bit of old bone. Now though, nearly anyone can not only make music, but also record it and distribute it to the world. You’ve got to admit, that’s a pretty impressive step forward. The issue now though has become, not making your music, but getting people to listen to it. This post first appeared as a news article for Now Then Records.